Bali is known for its relaxed vibe – sitting on the beach in the sun, surfing offshore and hiding in the rice terraces. Tourists generally flock to Kuta, Seminyak, Ubud and Uluwatu, given their proximity to the airport and endless hotel choices. Bali is also a very deserving place for a biking holiday. I was blown away with how easy it is to escape other tourists, and get my explore on. The landscapes are wonderfully diverse, the nature of the Balinese people is inspiring and the cycling is fun and interesting. The highest point on Bali is Mt Agung (3031m), but the majority of the central region is well over 1000m, keeping the air cooler than the lowland areas. The majority of the cycling hotspots are in the central and eastern regions of the island. You’ll find all kinds of environment here; rainforests, lava rocks, pine trees, bamboo trees, rocky outcrops, coloured sands and the driest, most arid land. It’s possible to connect the small mountain roads to complete a multi-day loop, or alternatively get a lift up into the hills for one-day rides. Let’s take a look at the best of what Bali has to offer! Fancy yourself pretty handy on the mountain bike? You should definitely check out the Bali Bike Park for a day. There are between 5-10 trails of varying difficulty on this property 1300m up in the mountains. You will be shuttled up the hill all day until you can no longer ride. HERE is a video I shot at Bali Bike Park on cross country bikes, but the best bikes for the job are definitely 5-6 inch trail bikes. My favourite road in Bali is located right up in the mountains near Munduk. The road is like a roller coaster, taking the steepest, fastest lines up and down the volcanic hills – wide enough to fit just one car. The surface is smooth as glass, the freshly-laid bitumen offers ample grip around the banked corners. The icing on the cake is a recently painted white line dividing you with the scooters heading the other way, forcing you to keep left and take the corners tight. This is an A+ bike path in the mountains – it’s perfect! Rather than provide you with a route, have your own explore of the rice paddy roads around Jatiluwih. There’s so many singletrack roads connecting all of the rice fields. These rice terraces are world famous, in fact, since 2012 this land has been protected by UNESCO. It isn’t just the beauty of the landscape that makes the rice terraces culturally significant, but rather the water management system of canals and weirs, known as subak, which has been in operation for 1200 years. THIS video shows us having a play on our bikes one rainy afternoon. If you’re not keen to go adventuring, Bali Bike Park, Bali Mountain Biking and Infinity run tours here. These two trails start at the same place at 1700m elevation, and wind their way down to sea level. The Crater Rim Trail follows the outer rim of Mt Batur to offer spectacular views both left and right. The Ocean View Enduro uses a higher ridgeline which you peel off to descend 1400m through all kinds of forests, villages and farms. These trails are best tackled with a guide on a 5-inch plus dual suspension mountain bike hired from Bali Bike Park. Infinity or Bali Trailblazers also run slightly different routes towards Mt Batur. HERE is my video of the Ocean View Enduro. This is the best section of coastal road in Bali, in fact every other coastal road pales in comparison. It’s certainly not a flat section of road; you will be busting your gut to climb some of the sections of road. But you will be rewarded with twisty roads, ocean views and lots of small villages. There’s lots of great accommodation closer to Amed. You’ll find a section of THIS video riding along the Amed coast. The windy coastal road near Amed is simply stunning. 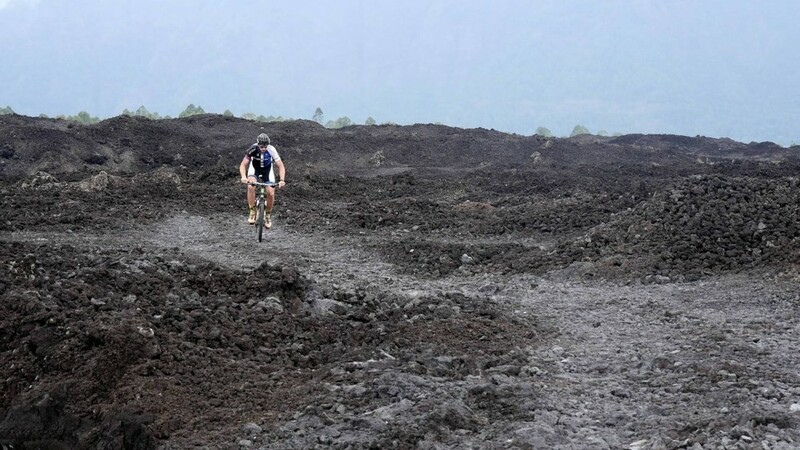 An out-of-this-world experience, this lava rock circuit will require a mountain bike to negotiate the terrain. Piles of black volcanic rubble formed a unique landscape that I’ve simply never encountered before. There is very little green amongst the black, giving the impression that your are riding your bike on another planet. HERE is a video of us having fun in the volcano. 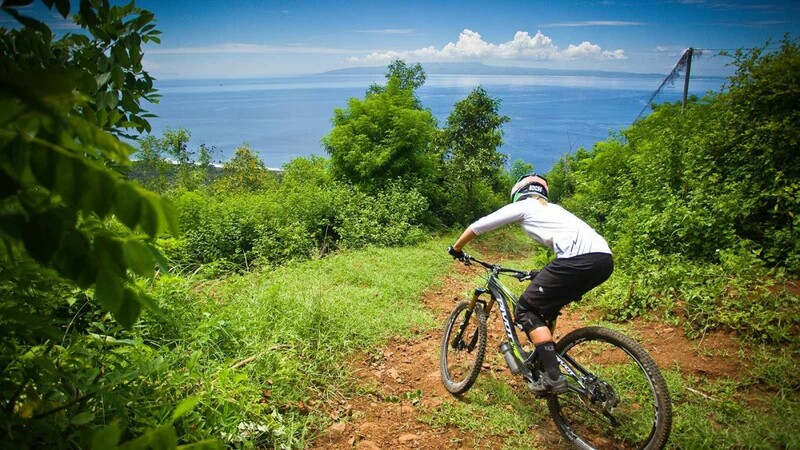 Bali-Rides, Infinity Mountain Bike, Bali Mountain Biking and Bali Bike Park can guide you through this region. Cycling on the volcanic rocks of Mt Batur. These road descents are great fun! There’s probably more than 10 different options which will take you to within 20km either side of Ubud. Just pick a road (the smaller the better) and have a great adventure. Try to bring a smartphone with offline maps to make sure you don’t get lost. Or maybe just get a guide from any of the tour operators – almost all conduct rides in this region. 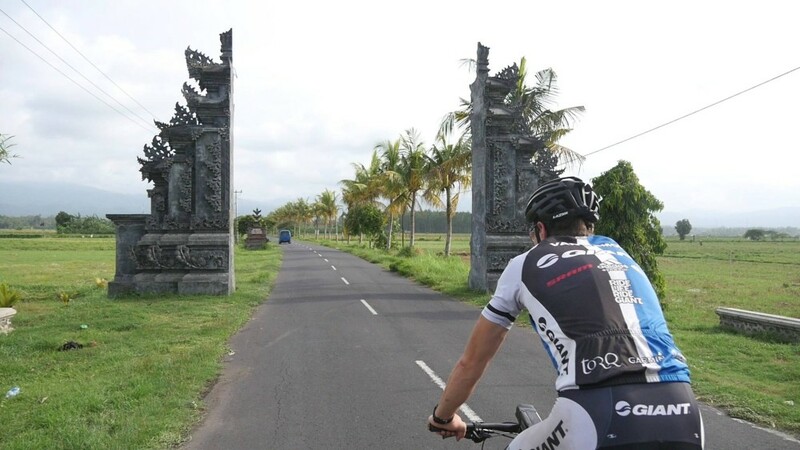 The romance and intrigue of completing the 350km lap of Bali pushed me to get out and do it, but the reality is that the ride is average at best. For the most part, the coastal road has lots of cars and trucks and the most beautiful parts of Bali are up in the mountains. Nonetheless, I made a VIDEO of my time completing the lap. 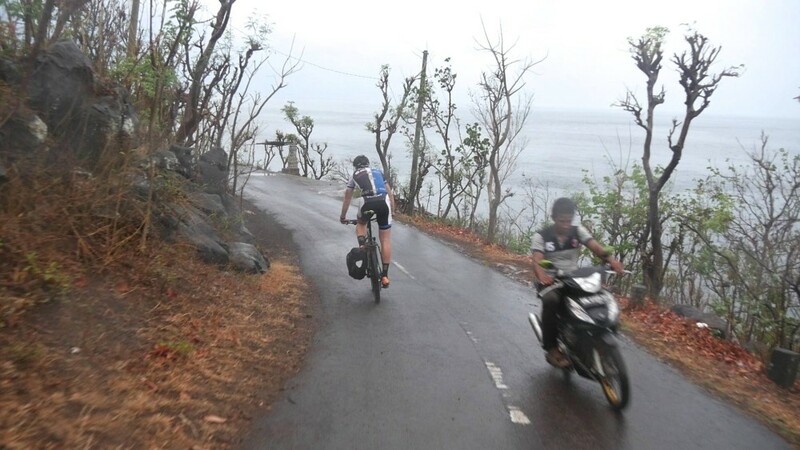 This 40km downhill ride drops 750m in elevation from the slopes of Mt Agung to the white beaches of the southern shore. You can descend this trail with Bali Trail Blazers or Bali-Rides. 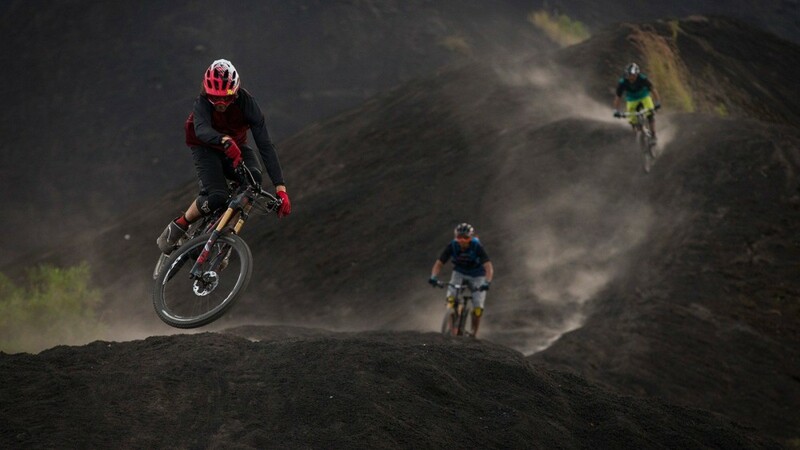 Gravity-focussed adrenaline junkies will love the challenge of hauling their bike to the summit of Mt Batur for sunrise, then pinning it down the steep volcanic trails once all the hikers are gone. Bali Bike Park and Infinity will guide you for this pretty awesome morning. This trail starts east of Kintamani near Mount Abang, and winds its way along the slopes of Mount Agung before finishing on the Telaga River around 10km from the shore. 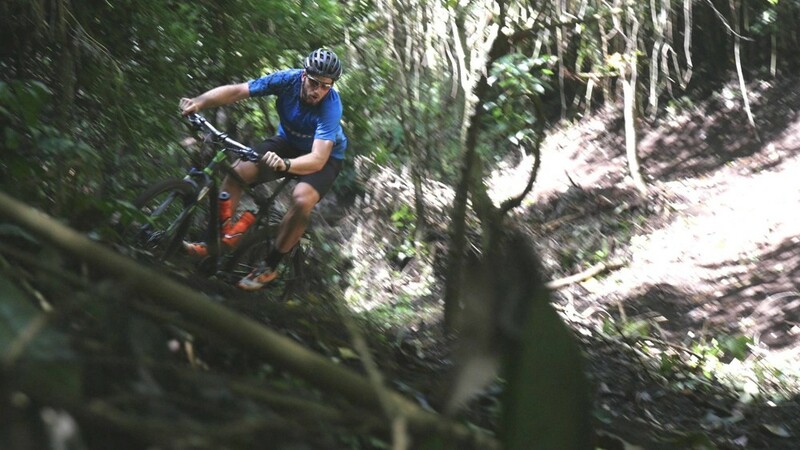 You’ll ride small trails through volcanic rock fields, forests and rice terraces, all with less than 400m of climbing! 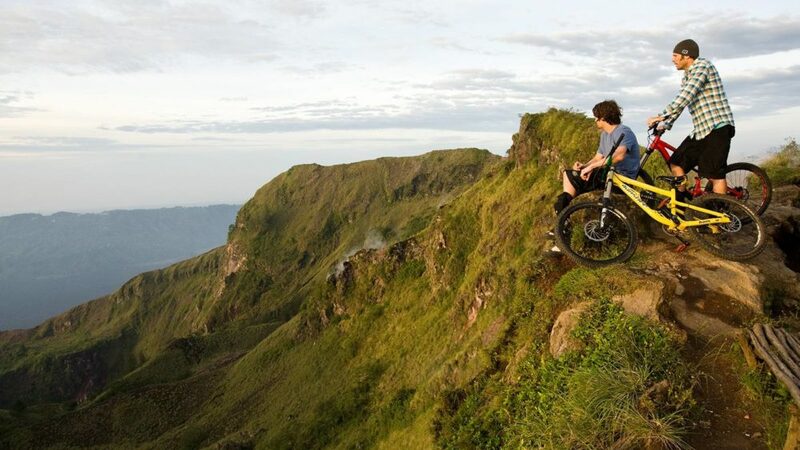 You can do this ride with Bali-Rides or a similar version with Bali Mountain Biking. This ride requires a high level of fitness given the 1000m of climbing (don’t worry, there’s 2000m of down). You’ll do singletrack through farm land, bamboo forest, rice terraces and quarries. 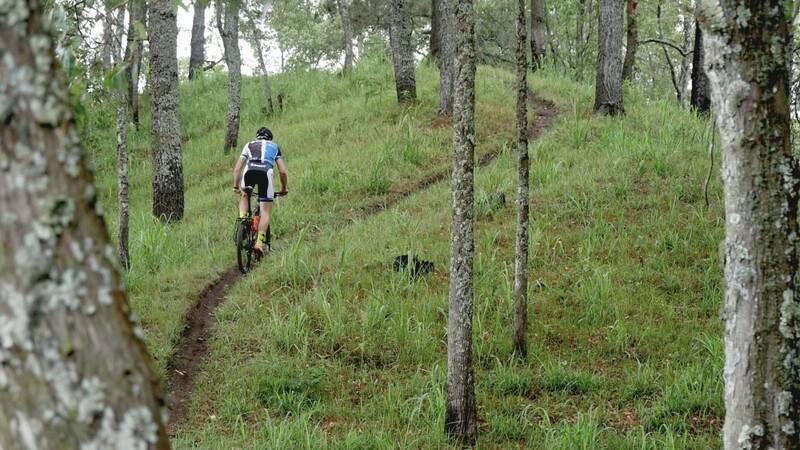 You can experience this cross country trail with Bali-Rides. Riding on the unique black sand is incredible. Everything around you is at such a contrast to the deadening black of the landscape. You should be a competent gravity rider to have maximum fun. Have a chat to Bali Bike Park if you want to do some runs! This ride takes you from east of Kintamani around Mt Abang and down towards the shore. The trail is unique in that it makes the most of the dry, arid environment found on the north of the island. 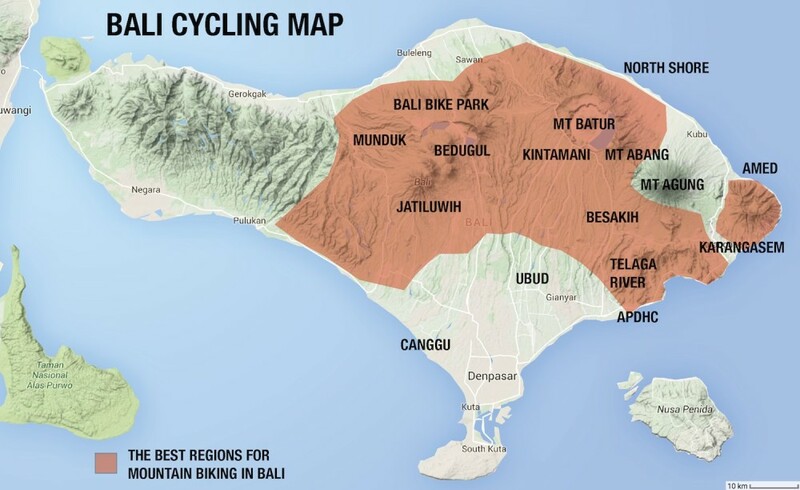 You can ride around Mt Abang with Bali-Rides, Mountain Biking Bali or Infinity. This trail has been built for DH racing, and is only recommended for highly skilled riders. Get in contact with Bali Bike Park for shuttles. Accommodation is plentiful across Bali, and unless you’re after something very specific – you’ll find it without a booking, wherever you go. Prices can be as cheap as US $10 per night for a room, but will be more expensive in popular areas. I always recommend having a place booked in advance for when you first arrive in Bali. I stayed at the Chillhouse Bike Retreat in Canggu and completed almost all my riding from there. Rooms for two start at US $125 per night, including all-you-can-eat breakfast and dinner. This place is a little haven, with spacious rooms, places to lounge and swim, and delightful organic food – all surrounded in lush greenery. There’s a reason why you’ll find so many 5-star reviews on TripAdvisor! In the smaller towns, you can find places with ‘hotel’ or ‘guesthouse’ signposted the front. Most accommodation actually has signage with arrows from the main street of each town. Susanna from The Chillhouse helped me regularly with tours, food and general advice. Are you a Bali tour operator? Get in contact to have your details added. Anytime! Bali is located in a tropical region, so the temperature daily min/max constantly ranges between 23-32 degrees celsius (75-85 degrees fahrenheit). The rainfall is highest between December and March, and is lowest in June through August. The mountain biking advantage of coming in the wet season is grippy trails with little dust. If you’re coming from another country you will fly into Denpasar Airport, located near the southern-most point of the island. Direct flights are available from Australia, China, Thailand, Malaysia, Singapore, Korea, Japan, UAE and more. You can cross by ferry from Indonesian islands Java and Lombok. Accommodation is relatively frequent, as are places to eat and shops for snacks. If you’re not bringing your bike, you can hire decent mountain bikes from any of the commercial tour operators. If you’re a keen cyclist, you might want to bring your own SPD pedals and shoes, shorts, jersey, helmet and gloves. Otherwise, all you really need is clothes and toiletries. Low gearing is essential for Bali. If you’re on a road bike, you’ll ideally have a compact crankset (50-34) and wide range cassette (11-32) at a minimum. Stock mountain bike gearing is generally adequate. If you’re on a touring bike carrying a lot of gear, you should have a low gear of 20 gear inches or under (24-34t). The main roads are well paved. The secondary roads can be rough at times. The wider your tyres, the more off-road you can go! Don’t Forget to Check Out My Bali Photo Essay for Cycling Stories from Bali!